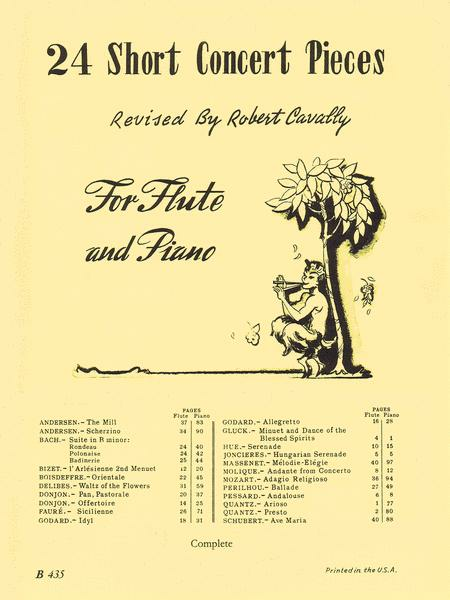 Flute and Piano (2-book set). Edited by Robert Cavally. Woodwind Solos & Ensembles - Flute Collection. Robert Cavally Editions. Baroque and Classical Period. Set of performance parts (includes pull-out flute part). 137 pages. Southern Music Company #B435. Published by Southern Music Company (HL.970038). ISBN 1480385352. 9x12 inches. Compiled and revised by Robert Cavally. 33 of 84 people found this review helpful. pieces are beautiful. I would hightly recommend this book. 38 of 84 people found this review helpful. it. I love this book. 37 of 83 people found this review helpful. L'Arlesienne, Massenet Melodie-Elegie, and Pessard Andalouse. 34 of 76 people found this review helpful. July 21, 2007 A Must Have !! This is an excellent book. Use with the Barbara Hopkins CD that contains 19 of the 24 pieces. 43 of 87 people found this review helpful.